When is it time to adopt a second language for your social media channels?The question shouldn’t be answered lightly, as you’re undoubtedly familiar with the energy and time required to build your social community and the reputation and voice that you’ve developed.Here are 10 key questions to answer when considering a second language for social media. Perhaps one of the most confusing areas of Twitter are hashtags. How do they work, who can use them, are there huge directories somewhere where they list all the official hashtags you can use? Once you have some of these questions answered, there’s even more questions surrounding TweetChats and Live Tweets and how those work (we’ll elaborate on these more in the next couple blog posts). Do You Remember These Top 10 Social Media Stories of 2012? Last year was an amazing year for Social Media. Records were broken, social media became a more integrated part of our lexicon, possibly to the point that you might not have had to explain what Twitter was to most people. You should dress for the job that you want, not the one you have. That adage probably applies to Twitter too – you should tweet like an influencer if you want to become one. So what do the top social media influencers tweet that we can learn? I’ve broken down the top words each of the top social media influencers use most frequently and have extrapolated some lessons. So you decided to bite the bullet and get into social media. Maybe it was your company’s new year’s resolution. Well, you’ve definitely come to the right blog, and there’s plenty of posts that can help you strategize: how to add humor, how to strategize for B2B, even signs that your social media strategy will fail. Houstonians are proud. We’re Texans, we’ve got great sports teams and our economy has remained strong throughout the recession. 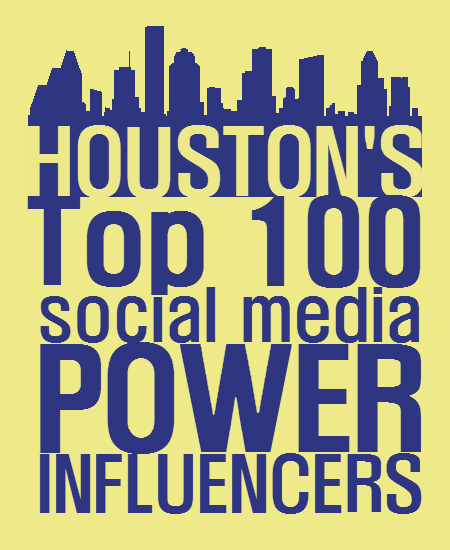 Our city is one of the largest metropolitan areas in the nation, and is consistently ranked among the top in business, energy, technology and medicine, yet Haydn Shaughnessy’s list of the top 50 Power Influencers in Social Media fails to list a single person from Houston.